View Boswell’s Stages power file. This stage was steady for most of the day. Interestingly, Boswell put out his Peak 90 Power of 247 Normalized watts in the middle of the stage, and his Peak 60 Power of 267 watts in the final hour. Boswell also seems to prefer a lower cadence than many of his fellow riders. He averaged only 81 rpm on this stage. Boswell was able to average 27 mph over the entire 126 miles. View Boswell’s Stage power file. Again in stage 2 we see Boswell’s peak power values spread over the entire stage. 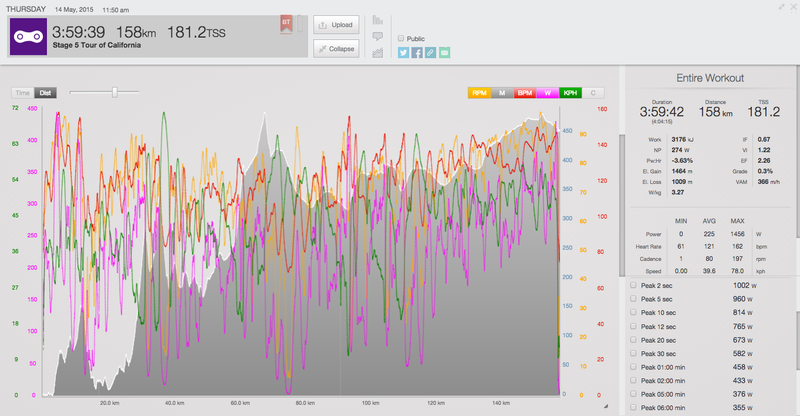 On the early climbs he sets his Peak 1, 2 and 5 minute power values. His Peak 1 hour value of 268 Normalized watts starts just before mile 40, but his Peak 30 minute power of 282 Normalized watts comes in the final miles where he also averages 31 mph. In the final hour of racing, Boswell averaged 28 mph. We see an even lower cadence on stage 2, where Boswell pushed an average of 76 rpm. Not surprisingly, Boswell’s peak power values are set around Mt. Hamilton. His Peak 20 power of 382 watts (5.54W/kg) was set on this climb. It was not an easy route to the base of the climb. Boswell set his Peak 10 power of 407 watts (5.91W/kg) on the first climb just four miles into the stage. Descending Mt. Hamilton, Boswell hits a top speed of 55 mph. The racing started early on this stage. 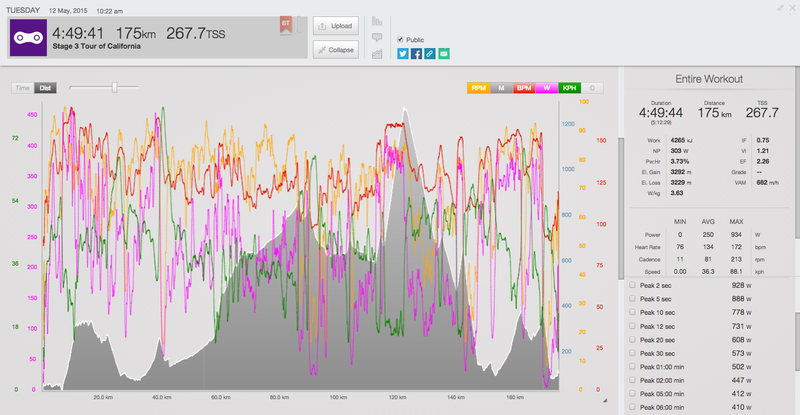 Boswell set his peak 1 Hour power in the first hour, averaging 211 watts. 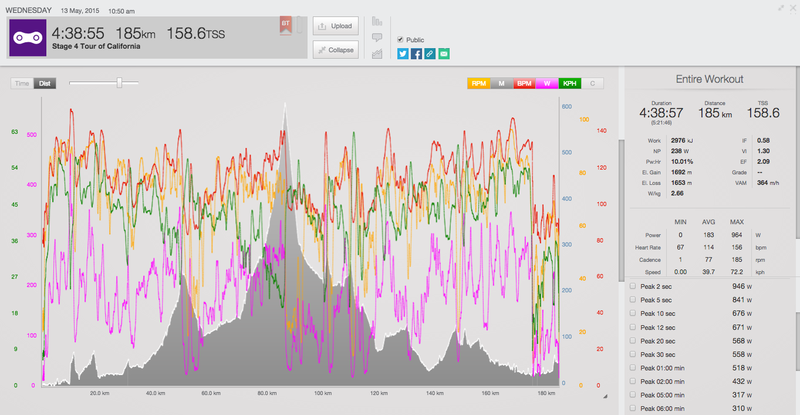 Just 30 minutes after setting his Peak 1 Hour power, Boswell set his Peak 30 minute power of 243 watts. Again we see a low cadence, 78 rpm, with an average speed of 26 mph. Boswell’s peak power values are spread out on this stage. His Peak 1 and 2 minute values are in the first 20 minutes, his peak 5 and 6 power values are at the 2:30 mark, and his peak 12 and 20 minute values are at the end of the stage. For the entire stage, Boswell set a Normalized Power of 275. In the final 30 minutes for the stage, Boswell put out 320 Normalized watts. Moved from Big Bear due to weather, this TT was shortened to 7 miles. The tight corners at the beginning lowered Boswell’s average power. He put out 305 watts in the first half, but power the 2nd half at 411 watts. Boswell’s average speed was 29 mph and his cadence was 89 rpm. 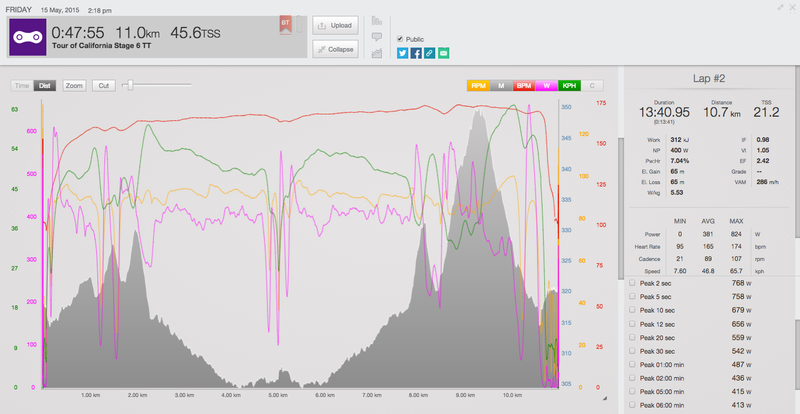 Not surprisingly, most of Boswell’s peak power values are during the climb up Glendora Ridge Road to the Top of Mt. Baldy. 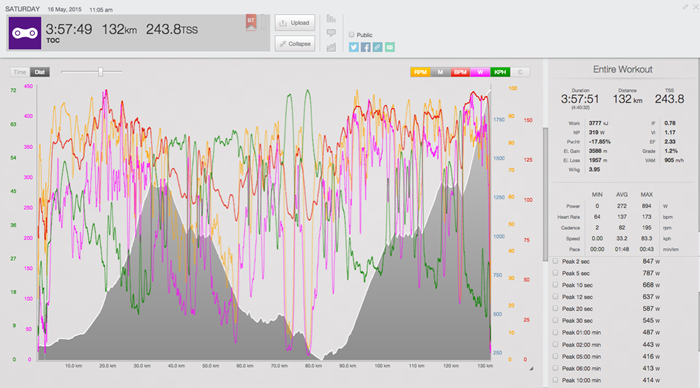 That section comprised his Peak 90 minute power value of 339 Average watts (4.92 W/kg). At the start of the final ascent up Mt. 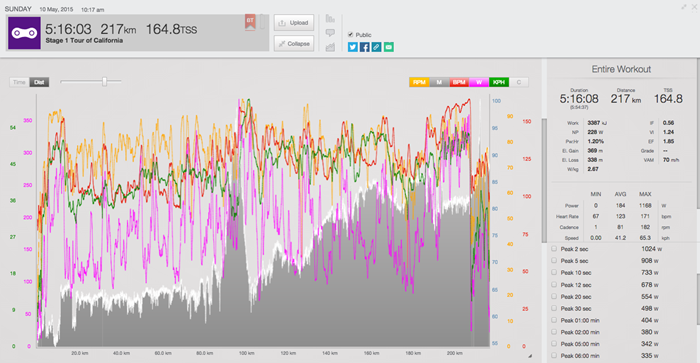 Baldy, Boswell put out his Peak 20 minute power of 394 Average watts (5.72 W/kg). In the final hour, Boswell climb just over 4,000 ft. at only 15 mph while pushing 363 Normalized watts. 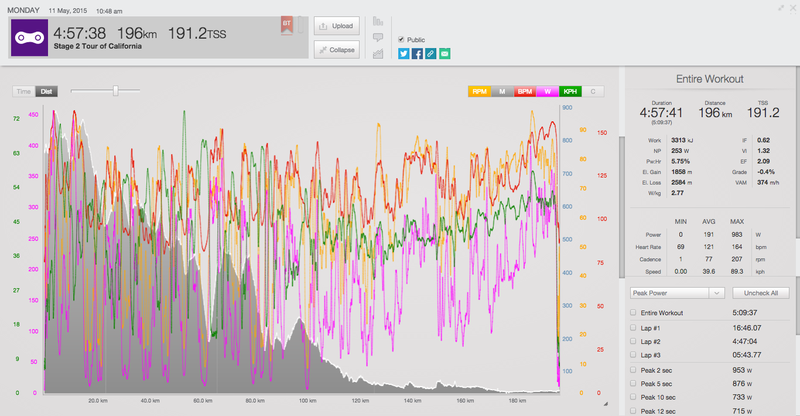 Boswell’s Peak 20 minute power of 320 watts occurred in the middle of the stage. Over the full stage, Boswell had a Normalized Power of 293 watts at an average heart rate of 131 bpm. 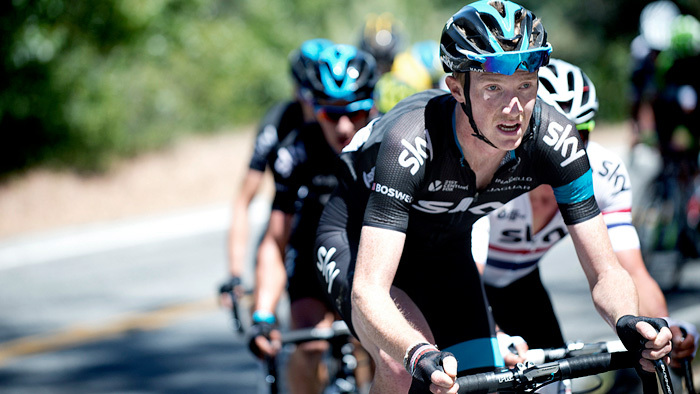 This was the fastest stage of the tour for Boswell, who averaged 27 mph.